Leong's Legends, continued. Sounds a bit like a martial arts movie, doesn't it? Well it turns out its just another restaurant amongst the thousands others in Chinatown, this time peddling dishes based out of Taiwan. 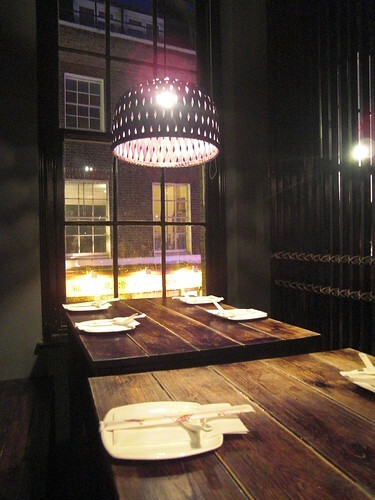 As the name suggests, this is the second in a series of restaurants, the first based on Macclesfield street. Their main restaurant has quite a selection of dim sum, whereas "continues" has a bit more of a focus on more traditional Taiwanese dishes. 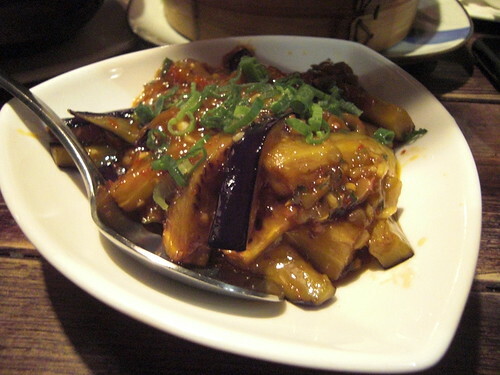 One of their specialities is their Siu Long Bau, known under many guises. 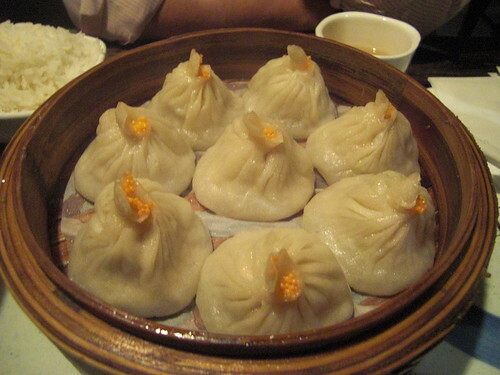 Some call them Shanghai dumplings, some call them soup dumplings, these are steamed pork dumplings which contain and release a sizable broth when bitten into. A personal favourite, these had to be ordered. Served in portions of eight for under a fiver, I thought that was pretty decent value already. Biting the top off, they did indeed contain plenty of "soup" although I was disappointed by how strong the overall taste of ginger was. Not bad, but not great. So then we cracked onto our main meal where we ordered a hotch potch of dishes. Feeling we really should order some veg although both not really being in the mood, we compromised with some spicy aubergine. Simply fried in a viscous gravy, it had a strong chili kick, probably from the dried chilli's. Delicious with rice, actually better on its own. 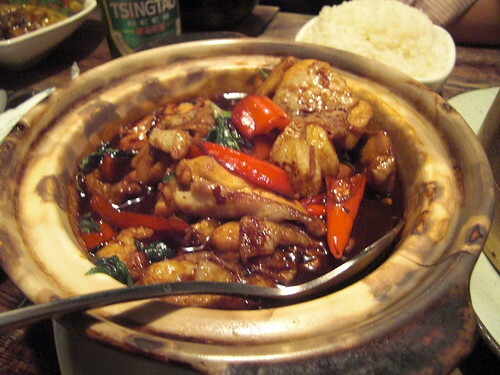 We also ordered a chicken with rice wine, whilst a delicious dish, was more of a distraction for what was to come. Although we didn't finish it, I did rather enjoy it and would definitely order it again. So there it is, in all it's glory, a whole crab. Many of you who read this blog know of my aversion to most seafood and crab in particular, so it was quite a departure for me to commit to this. And you know what, I rather enjoyed it. Doused in garlic and those dried chilli's again, it threatened to overpower the subtle taste of the fresh crab, but instead added just the right balance. 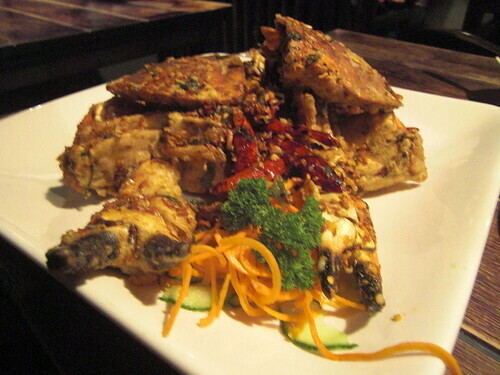 The sweetness of the crab had occasional burst of flavour as you bit into each nugget of fried garlic and finished off by that slow gentle burn of the chili. I was surprised to enjoy this, but I think it had a lot to do with the apparent freshness of the produce. A good meal, although as usual, we ordered a little too much. Reasonably priced, but probably on the upper scale in Chinatown terms. I would definitely try it again, but I think I need to give the original place a go first. After all, where would a sequel be without the gig that kicked it all off in the first place? I've somehow completely failed to go to Leongs Legends but those soup dumplings do look gorgeous. What's on the top of them - cod roe? @meemalee No idea, they had no discernible individual flavour. Im guessing something with food colouring? The XLB always look different every time at Leong's Legends, although I've never seen them with that roe on top. This place is one of my Chinatown faves. Also, Dim Sum here is cheap and cheerful and slightly different to other places in the locale. This was the place I was trying to remember when we were having a pint earlier!